That is, until I found out how much better my employer's VPN works from Windows. It doesn't work well from MacOS, barely works under Ubuntu, and oddly, works okay under Solaris 10, but it's far from perfect. A few days ago, I logged into the VPN from the Corporate-mandated Windows XP Work PC in the office and was kind of in awe. We're talking an order of magnitude better, on a logarithmic scale. Figures, right? With all the after-hours remote work I'm finding myself doing more and more often these days, it looks like I'm installing Windows! 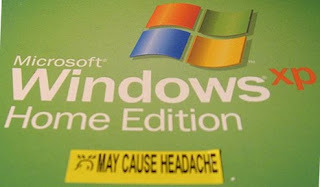 As a self-proclaimed Operating System Junkie, I suppose it wouldn't hurt to dabble in Windows just a little. After all, my wife's already running a game server on Win2k. What can it hurt? The only machine I have laying around that I felt would do Windows justice is an old Dell PowerEdge tower server, which spends most of its time running Ubuntu. I didn't feel like re-partitioning or re-installing everything, so I unplugged the Ubuntu hard drive, scared up an old 20GB drive for Windows, bolted it into place, then went to town installing Windows. My goal was to move the Windows hard drive to the secondary IDE controller once installed, then figure out how to get GRUB to boot Windows. You have swapped the Linux hard drive out for a fresh one (also the first hard drive) and installed Windows to it. grub> boot                  # What do you think? Yeah, right. It locks up. Doesn't even try. Reading up on the GRUB documentation, I found the map command. Score! This tricks the BIOS into swapping drives around. While you're in there, you may want to look for the Timeout line as well, and increase it. I chose not to, because I'll be booting to Windows very rarely. Now, give it a reboot and make sure that both Windows and Linux boot from GRUB as expected. This little project actually went easier than I'd expected, mostly thanks to GRUB's documentation. While extensive and technical, it is well-organized. By the way, I tested the VPN for about 9 hours today and it was rock solid the whole time. Better than I can say for the other operating systems I've tried it with. At least I got some benefit from using Windows. If only I had awesome coffee, an IBM Model M and my MX Revolution mouse at the office every day. And if I could work in my pajamas. Now, if you'll excuse me, I need to go take a shower with concentrated chlorine bleach and a cheese grater to get rid of all this Microsoft residue.